The SFT Phase Monitor II is a powerful analytical tool for determining the solubility parameters of compounds and mixtures in subcritical and supercritical fluids. It provides direct, visual observation of materials under conditions precisely controlled by the researcher. Experiments can be performed in liquid or supercritical carbon dioxide and in other liquefied gases. Additionally, the effect of co-solvents on the solubility of compounds in supercritical carbon dioxide can be investigated with this instrument. It allows the end user to view dissolution, precipitation, and crystallization of compounds over a wide range of pressures and temperatures. 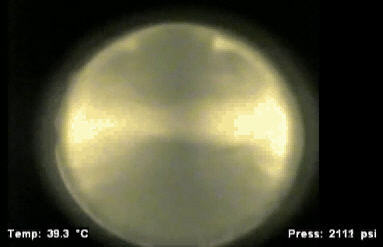 Experiments may be performed from a few hundred psi to 10,000 psi (68.9MPa) and from ambient temperature to 150° Celsius. The Phase Monitor II is extremely useful for determining the critical point of binary, tertiary, and complex mixtures. The changes in phase behavior as a function of temperature, pressure, and sample concentration can be investigated rapidly, saving time in the scale-up of supercritical fluid processes. The phase monitor can be utilized to determine the processing conditions in which each compound in a homologous mixture solubilizes and/or precipitates. This data is useful for determining processing conditions for selective extraction, reaction, and/or fractionation of compounds of interest. Additionally, supercritical “anti-solvent” applications are possible. 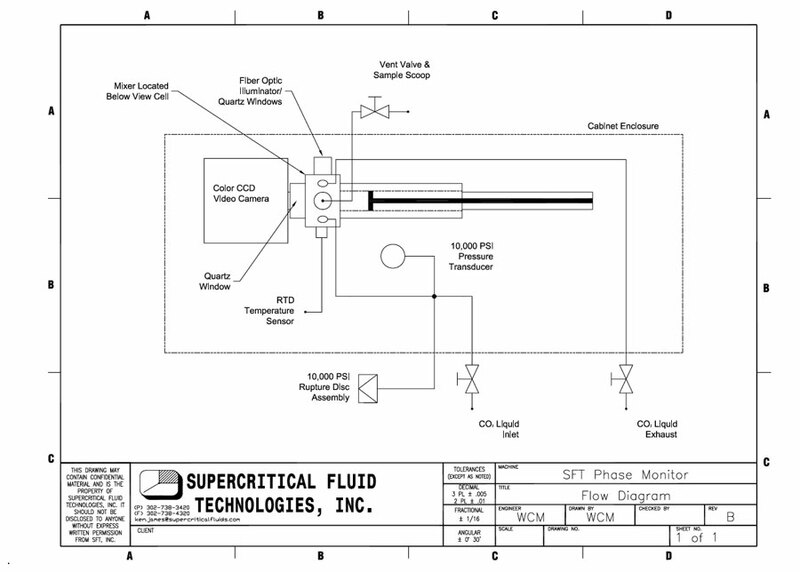 The Phase Monitor II is useful for other supercritical fluid processing operations, such as crystallizations and reactions. For example, the Phase Monitor can be utilized to determine the solubility of reactants and products so that the conditions for running supercritical reactions can be determined. It is possible to perform small-scale batch reactions within the Phase Monitor II. Other useful applications for the Phase Monitor II include determining the cloud point of polymers and the degree of polymer swelling in carbon dioxide and other liquefied gases. More sophisticated applications include the determination of processing conditions for impregnating materials into swollen polymers and surface deposition experiments. The SFT-Phase Monitor II consists of a manually controlled syringe pump integrated within a 30 ml view cell. A CCD camera with a fiber optic light source allows clear viewing of the cell’s interior. The view cell can be oriented in a horizontal position for solubility work with liquid materials and in a vertical configuration for solubility work with solid materials. The sample holder accommodates liquid, solid and powder samples. Materials such as fine powders and liquids may be placed in a small glass capillary tube which mounts in a holder recessed in the sample platform. Here, samples are held securely in the optimal viewing position for solubility and melting point studies. User may set a heating rate and dwell time through a Fuzzy Logic Controller. 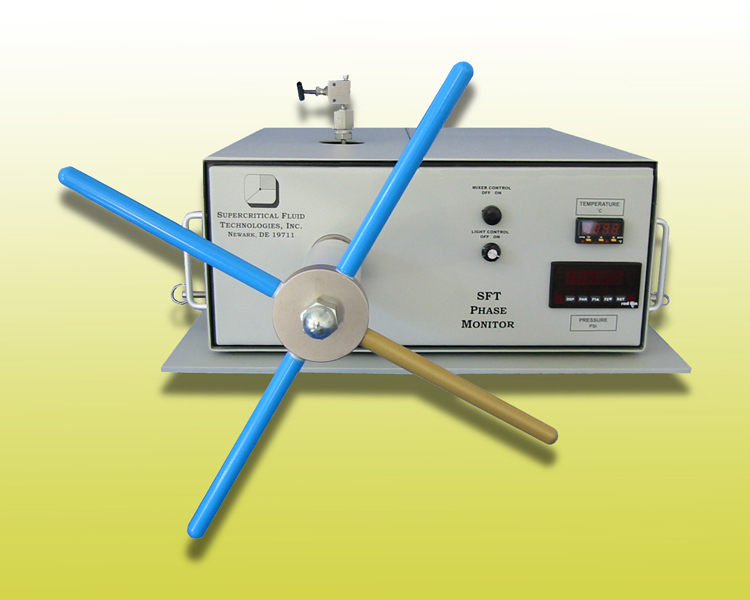 Temperature is monitored and controlled by an internally mounted RTD. 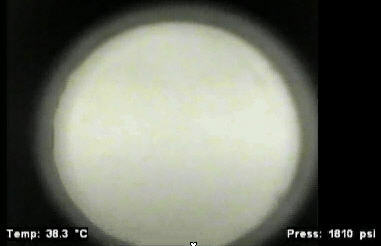 Temperature range: ambient to 150°C. A variable focus, color CCD camera is attached directly to a quartz window. Illumination is provided by a variable intensity, fiber optic light source through a second window. A color monitor/VCR is included. Real time video from the phase monitor may be converted into MPEG or AVI digital movies that can then be further digitally manipulated. Includes, hardware, software and interface cables. Power Requirements: 120 VAC., Single Phase, 10 Amps (International power available). Gas Supply: Helium head space liquid CO2 cylinder with dip tube.